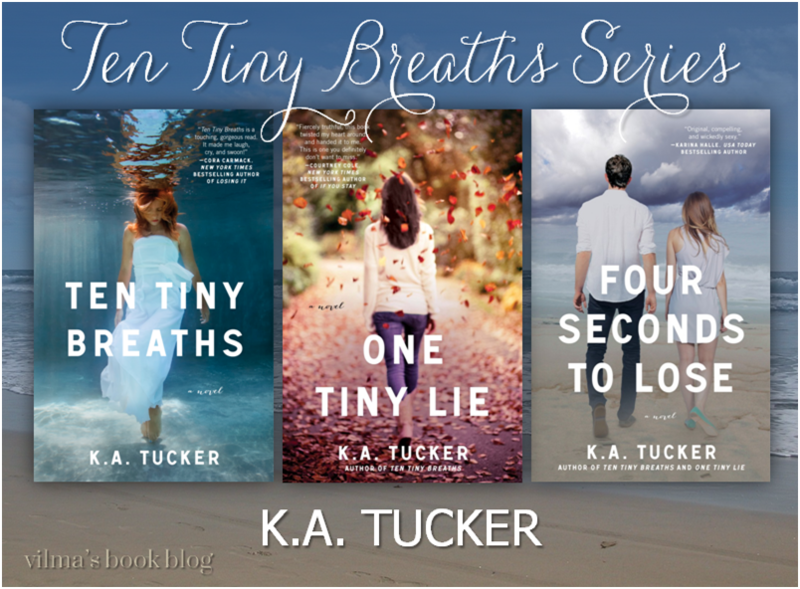 ONE-DAY ONLY GIVEAWAY: Signed Copy of Ten Tiny Breaths by K.A. Tucker! To celebrate the paperback release of TEN TINY BREATHS by K.A. Tucker, I have an exciting one-day only giveaway where 1 lucky winner will win a signed copy of the book. The giveaway is open internationally! I’ve heard so many amazing things about this book! I cannot wait to read it. Getting into a new series! Back when I haven’t read Ten Tiny Breaths, I was really looking forward to Kacey and Trent’s relationship (probably because I’m a huge fan of relationships). This series has been on my TBR list since it first came out. I have heard such great things. I guess I’m going to have to push it to the top if my list now. Read it, and loved it! I have read nothing but great reviews for this one and I can’t wait to read it. I’ve heard so many great things about this series! The series is on my TBR list. I want to know what the secret is. Thanks for the giveaway! I’ve already read this and I loved it!! Looking forward to re-reading this book and seeing Kacey grow stronger and falling in love with both her and Trent again as a couple. Hiya! Thanks for the give away! I have this on my TBR shelf. It looks and sounds amazing!! This would be an honor to win!! been wanting to read for a while !! I have been wanting to read this book for awhile I just have not had a chance but with all the great things being said about this book I need to move it to the top of my list Thank you so much for the great giveaway. Thank you for the giveaway! I am looking forward to reading this book because all my friends said it was absolutely amazing!!!!! This is one of my absolute favorite books! I love Trent!! Thanks for the giveaway! Thanks for the giveaway! I am looking forward to exploring the relationship between Trent and Kasey. Just to read another series. I have always wanted to read this book and series. Reading an amazing book. I have heard awesome things about it! Read lots of reviews recommending this. I’ve already read Ten Tiny Breaths and I LOVED it! Kacey is one of my all time favorite female characters! I swoon for Trent! This story is fantastic! Thanks for the giveaway!!! I’ve seen this book but haven’t read it yet. Thanks for the review and the contest! I’ve heard great things about this book. It’s on my TBR list. I’m looking to get lost in a new literary world. All of the reviews I have read have been great! I have heard nothing but wonderful things from people who have read this book! I am really looking forward to reading it! Thank you for the chance!! I have yet to read this book…..Thank you for the giveaway!!! This book looks like a great read, plus it is first set in the state I live in of Michigan! I have a fondness for books with Michigan in them for some odd reason. Maybe, it is because it makes it a little more real to me? I already read Ten Tiny Breaths and absolutely LOVED it! It’s one of my favorite books! On my to read list. Cant wait to read them!!! I have read and LOVED as well as One Tiny Lie. I look forward to Cain next. Everything!!! Excited for this book to release!!! I’m most looking forward to starting a new love story. I’ve heard great things! can’t wait to read it! Everything. I have heard such good things about this book. Can’t wait to read it. I am most looking forward to the emotional journey, it’s been lacking in the last few books I’ve read. I know! incredibly tragic! I think that’s obviously part of her journey to really face it all and feel again. Those who read..loved it.Oh my,I wish I could get my hands on those books.Thanks for the giveaway. I’ve heard great things about this series. Would love to own so I could read it! I love a story where I can get emotionally invested. Usually when the story is based around a major tragedy, I am hooked. absolutely loved this book and would love a signed copy for my shelf! Beautiful cover! Thanks! I would LOVE to read it……definitely in my TBR but the stupid list keeps growing faster than my eyes will let me read!!! I’ve heard this is great! I’d love to read it. One of the best I’ve read. Looking forward to re reading. Please let me win… 😉 .. good luck to everyone. .. I live near Grand Rapids, so I’m interested to see how it’s incorporated into the story. I am very interested to read this book because it looks that Kacey is a very strong and deep, does not give up. I’d like to read it because I find it interesting to see how Trent and she established a relationship. As you will have overcome the problems, because I hope that the excess. The book seems interesting because it is not the typical happy story, it is real, it is deep. I really like the book covers! I love this series !!!!!!!! Can’t wait until I get the third one !!!!!!! !